Unclutter your Tour-Pak of small items! 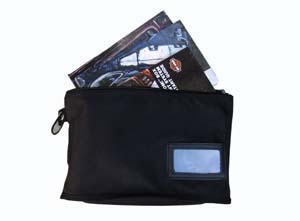 MH-01: Harley-Davidson HOG Handbook/Map holder. 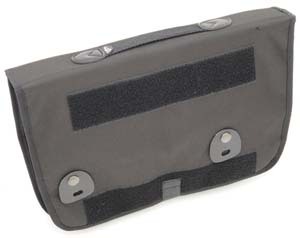 Comes with velcro attachment for easy locaton of your Handbook to the lid of your tour-pak. No longer will your nice HOG membership Handbook be ripped or torn at the bottom of your busy tour-pak. Now available at your fingertips. Quick slide opening. Easy low profile installation! 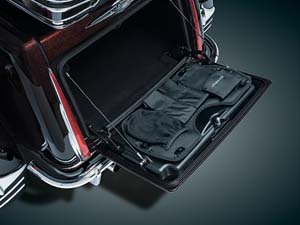 LO-98: Keep the smaller items organized and easily accessible with the Trunk Lid Organizer that mounts securely to Indian trunk lids and contains a variety of pockets for storage. Fitment: '15 to current Roadmaster (except Roadmaster Classic) & '14 to current Chieftan If Equipped with a Tour Trunk. LO-2H: Fits '93-'13 Touring and Trike models equipped with a King, Ultra, Chopped or Razor-Pak Tour-Pak®. 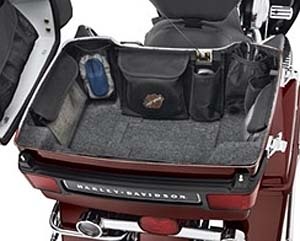 Does not fit '08-later CVO™ Ultra models with Power Locks, or models equipped with Tour-Pak® Spoiler Kit, Tour-Pak® Light, Mini Tour-PakLid Rack or Contoured Tour-Pak® Luggage Rack. LO-2R: This Lid Lining features a convenient six pocket organizer to keep smaller items conveniently at hand, and is shaped to fit the contours of the tour-pak lid for a finished look. 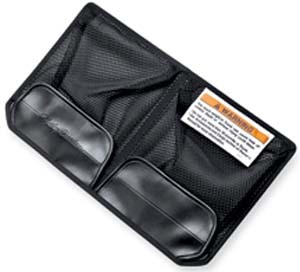 The organizer features 4 enclosed pouches, 1 mesh pouch and 1 clear mobile-device pouch. Hook-and-loop fasteners permit easy removal for cleaning. Soft gray finish is the perfect match for the original equipment tour-Pak bottom liner. 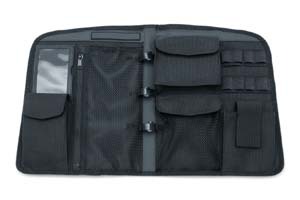 Organizer features 4 enclosed pouches, 1 mesh pouch and 1 clear mobile-device pouch. Fits model year 2014 to current King of Chopped tour-paks. LO-2P: This Premium Lid Lining features a soft-touch black felt finish to reduce noise, and a convenient series of storage pouches that provide easy access to all your essentials. Four flap pouches, and one mesh and one clear pocket provide plenty of storage. Hook-and-loop fasteners secure the one-piece formed lining to the lid. Fits model year 2014 to current King of Chopped tour-paks. 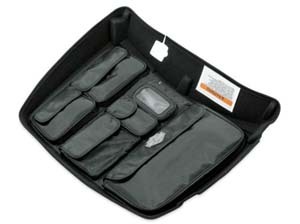 LO-1: Our highest quality, premium tour-pak Lid Organizer. Keep smaller items conveniently located under your Tour-Pak lid and organize your items for the long haul. 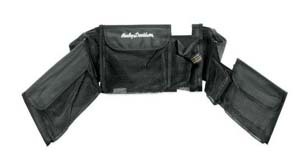 Features two zippered pockets, two expandable pockets and vanity mirror. Easy installation with our exclusive super-strength velcro. The strongest most seculre Lid Organizer in the industry, bar none! LO-2: Same product but with an extra pocket in place of the vanity mirror. LO-3: A variety of padded and see through mesh compartments offer protection and easy accessibility for frequently used items. Who says you can’t take it with you? Quick disconnect hook and loop and handles make it easily portable. 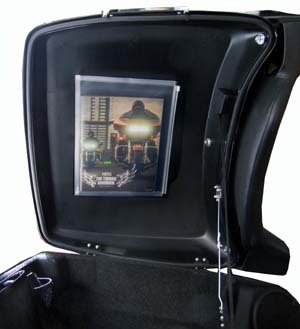 Includes: Lid Organizer Bag, Hook & Loop Mounting Strips, 5” x 7” Mirror. Dim: 13” x 20” (open). LO-3S: Trim, functional organizer fits snugly to the inner lid of a classic Tour Pack. 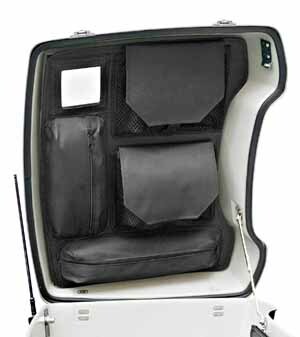 Organize your trip packing and max your cargo space using the nine separate storage pockets. A variety of elastic bands keep your flashlight, tire gauge and other gear in place, but easily accessible. Easily installs to the lid by attaching to the rack fasteners or with the included self-adhesive hook and loop fastener tape strips. Installation can be completed in minutes. Removes in seconds so you can use the convenient carrying handle to take your belongings in the hotel or your home at the ride's end. Rugged construction will last a lifetime with its 600-denier and 150-denier polyester materials. Measures: 20 1/4" x 14" x 1". WO-1: Convenient storage net wraps the interior walls of your King Tour-Pak for easy access to keys, cell phones, maps, and gloves. The organizer features three large nylon mesh pockets with Velcro closures, two elastic pouches, and two open pouches for easy access. Easily installed with included hook-and-loop tabs. Note: Both the LO-1 and LO-2 utilize a brand new "aggressive" Velcro which uses an arrowhead design instead of the hook design to hold the product to the Tour-pak lid. The hold is much stronger and thus will carry more weight. What is the difference between the regular Velcro and the arrowhead Velcro? Regular Velcro is simply a loop of nylon cut to produce a "hook". In fact that is why they call it "hook and loop". The arrowhead design of the Velcro is not as flexible as the hook design therefore once it grips the "loop" side of the Velcro, it holds extremely well. This molded nylon arrowhead hook is ideal for high strength applications. It was designed to hold sensitive electronic equipment on walls and shelves and has withstood some of California's strongest earthquakes. It has incredible holding power. Fits MY '93 to '13. WO-2: Convenient storage net wraps the interior walls of your King Tour-Pak® for easy access to keys, cell phones, maps, and gloves. 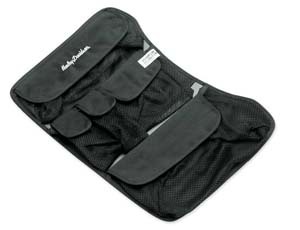 Features three large nylon mesh pockets with Velcro® closures, two elastic pouches, and two open pouches for easy access. Easily installed with included hook-and-loop tabs. Fits MY 2014 to current. 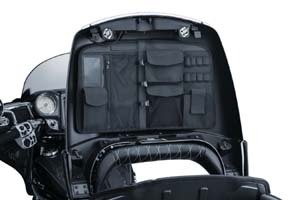 WO-3: This black organizer is made with polyurethane coated polyester and designed to mount in the front trunk of the Yamaha Star Venture and 2015+ Can Am F3 models. It requires two holes in the removable inner liner to mount the included two snaps. 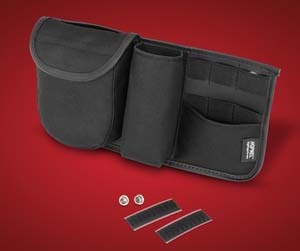 Additional hookand loop fasteners keep this organizer secured in place. 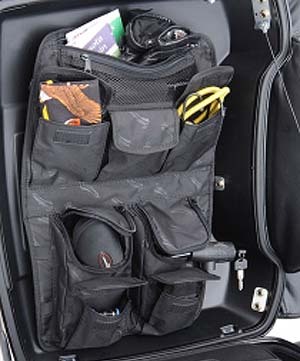 This Front Trunk Organizer has four pockets and three elastic holders for flashlights or small tools. The overall size is 12'' in width with a 6'' height allowing one 5'' x 6'' pocket sleeve,a second 2 ½'' x 6'' pocket sleeve, a 3 ½'' x 4'' pocket sleeve and a flat sleeve behind the 5'' pocket for additional storage. Made in the USA. 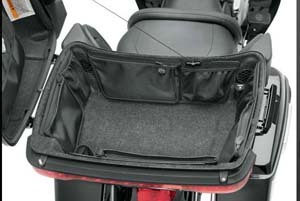 TTS-151: Trim, functional organizer fits snugly to the inside of the trunk's lid of your Harley-Davidson Trike. 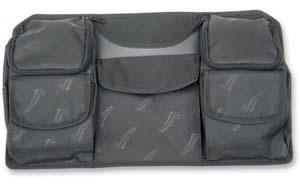 Organize your trip packing and maximize your cargo space using the organizer's storage pockets. 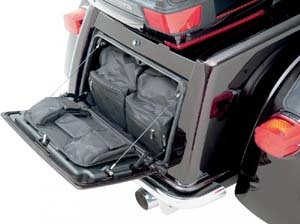 Mounts easily into the inside of the fold-down trunk's lid with included hook-and-loop fastener strips. Easy removal. 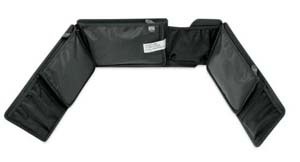 Features solid or mesh storage pockets that hold tools, electronics, or other convenience items. 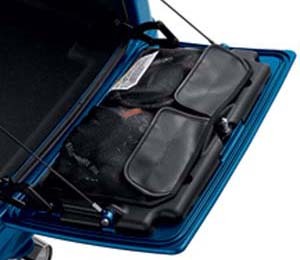 Trim in size, so you don't give up valuable cargo space in the trunk. Fits model year 2009 to current. TTB-260: A variety of padded & See through mesh compartments offer protection & easy accessibility for frequently used items. Quick disconnect & handles make it easily portable. Included Items: Lid Organizer Bag, Mounting Brackets & Hardware. Dim: 10" x 17" (open). Fits MY '09 to current H-D Trike models. 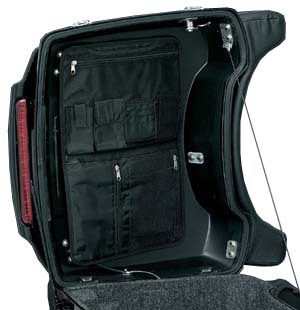 TTO-933: For on-the-road storage and efficiency, this ingenious organizer helps keep smaller items conveniently located on your trunk door for easy access. 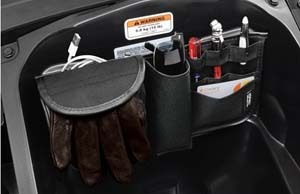 The easy-to-install self-adhesive organizer features two large nylon-mesh pockets with hook-and-loop secured flaps that offer quick access to keys, cell phones, glasses, gloves, and maps. 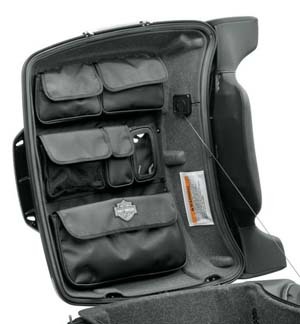 Organizer features an embossed "Harley-Davidson®" script logo. 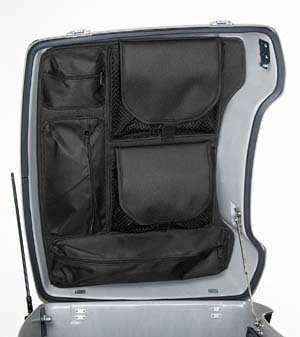 Add our Tour-Pak® Lid Organizer inside of the Tour-Pak® luggage for maximum organization. Fits MY '09 and later H-D Trikes. MP-01: Finally a nice organizer for your H-D manuals, paper-work and records. The MP-01 provides a place to put your H-D and Boom manuals as well as other paperwork and maintenance records. You should always take your manuals on long trips and now here's the place to put them. The MP-01 gives you a place to organize your manuals and paper-work and keep them in your garage or on the bike in your tour-pak or saddlebags. 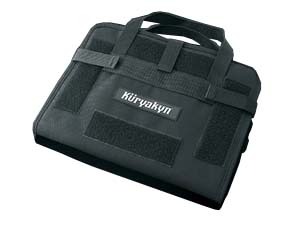 Water-resistant 1680 Denier heavy-duty 12" manual & document organizer.